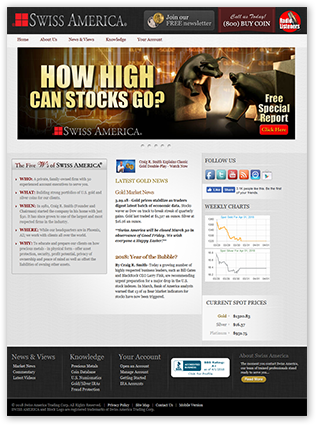 Overview: Swiss America Trading Corporation (Swiss America) is a precious metals brokerage. It was founded in 1982 by Craig R. Smith out of his bedroom in Phoenix, and is now one of the more established firms in the industry. Editor’s Note: We believe Swiss America’s composite star rating is artificially low because of the company’s lack of engagement with the TrustLink consumer advocacy site. Swiss America offers two services: setting up and establishing precious metals IRAs on behalf of its clients, as well as direct retail of precious metals. Swiss America offers both gold and silver IRAs while on a direct retail basis, customers can purchase gold, silver, and platinum, all in the form of coins. At present, retail investors comprise their main customer base. Swiss America is strongly focused on consumer education and customer service; their customer service motto is “If we have made a mistake, we will correct it promptly and properly”. To that end, Swiss America provides a direct email address and telephone number of one of their Vice Presidents that customers can contact regarding any complaints they might have. They even offer assistance with problems with other gold dealers by contacting the Numismatic Consumer Alliance on their behalf. Consumer education is highly emphasized on the site, and this appears to be the direct initiative of the company’s founder who has authored 9 books on gold and the modern economic and financial system. Mr. Smith is also quite prolific on the interview scene, and numerous videos of his interviews with various news programs are available on the site. Numerous pages on Swiss America’s site are dedicated to such educational resources, with access to newsletters, interviews, CDs and DVDs; a highly extensive collection. Click to see how Swiss America stacks up against the best gold companies! On first glance, Swiss America’s website is not the most modern looking and does look rather dated. Nevertheless navigation is very simple and despite the dated design, the overall look of the website is muted and does not utilize any of the current ‘in your face’ marketing that so many sites do nowadays. There are zero pop ups or flashing banners and you also don’t have to continuously scroll down to access any navigational links. The sidebar is a simple link to Swiss America’s various social media profiles, followed by data and charts for current spot prices of gold and silver. The information on the site is also neatly categorized; while the educational resources available are extensive, they are all available under the ‘Knowledge’ or ‘News & Views’ header. Overall we rate Swiss America’s website as easy to use and navigate despite its dated look. Swiss America maintains three main social media presences; Facebook and Twitter. They also have a YouTube channel, Google Play app, and iTunes app. Swiss America does not have the largest product range out there, nor is it a highly prominent company despite its long operating history. The company appears to have found its own niche, focusing on retail investors by offering high levels of customer service and consumer education. The company’s founder appears to be still highly involved in their daily operations and based on his books and interviews, it is clear that he truly believes in the value of precious metals investing and remains highly committed to his mission and vision.